I have a Tuesday-morning, Dakota Sewalong confession friends! When Rachel and I decided to do this, the plan was to share our finished Dakotas or two, to entice you to take part. Genius, right? Rachel kept her end of the bargain - you'll be blown away by her Winter Dakota in ponte knit - but the house move scuppered my plans unfortunately :o( So instead, I'm going to share my inspiration for my Dakota-in-progress. 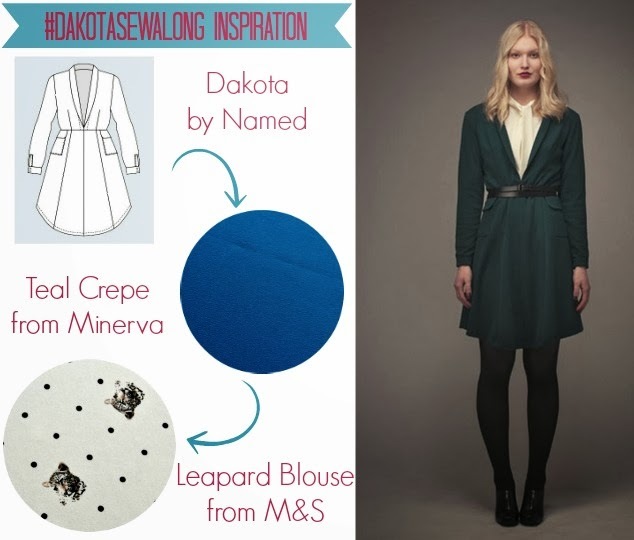 Dakota is actually a far cry from my usual style, but the luscious green fabric and Autumn styling beckoned me. As you know, I'm not really a solid colour kind of girl, so it was a revelation to me - especially when the urge to recreate an almost identically chic version took over. So, I set out to find suitable fabric with excellent advice from Vicki at Minerva Crafts, who has also generously supplied our fabrics. I settled on the most gorgeous Prada satin-backed crepe in a deep teal, which is unlike any other crepe I've encountered. It feels divine, is a dream to sew with and is the most incredible shade of teal (which pictures don't do justice to)! If you like what you read/see, the great news is that it's available in a range of delicious colours. I then turned my attention to what I might wear underneath my Dakota for dignity's sake. I loved Named's super smart styling with a blouse and realised I had just the ticket in my wardrobe - a white blouse from M&S with tiny black polka dots and small leopard heads! It's the perfect match for my Dakota, breaking up the solid colour and adding an edgy element. I just hope my vision turns out as glorious in practice! Have you chosen your Dakota fabric yet? I'd love to have a snoop! If you're struggling, tune in tomorrow and Thursday for some great tips from Vicki. If you still need some convincing that the Dakota Dress is for you, just check out Rachel's inspiration post. Im fabric jealous… this will be dreamy! It really is the nicest crepe ever! I second you on the crepe...watch out for my next Minerva make. Snap!! I think this sounds awesome Marie! Love this dress. However work is throwing many many curve balls at me this month so simply can't manage it! Alas!! ooh i have that teal crepe for one of my minerva projects - it's gorgeous isn't it? am too scared to cut into it! Yes, it's really stunning isn't it? Don't be afraid, it handles beautifully ;o) What are you plans for it? it's a retro butterick pattern 5707 http://butterick.mccall.com/b5707-products-15268.php?page_id=147. the cowl neck short sleeved version. can't decide whether to make the drapey bit from the shiny side. Oh wow - I CANNOT wait to see how this turns out! That fabric sounds amazing (is it actually 'Prada'?!!!) 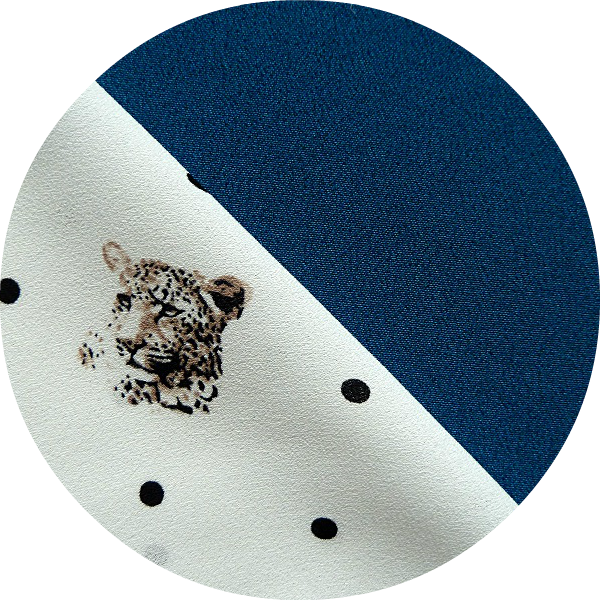 and your leopard spot (lol, v clever M&S!) blouse is awesome! Thanks for your enthusiasm Suzie, means a lot! And yes, apparently the fabric really is Prada! Oh, wow, I can't wait to see yours! I'm getting more and more excited for these dresses! Also, looooove the blouse fabric-- I'm going to be on the lookout for similar prints! Thanks lady! The M&S blouse is really amazing...they did well there! This looks like it's going to be an amazing dress! The fabric sounds yummy :) I won't be joining you guys since I'm going on holiday tomorrow, but I'll be reading along! Thanks Kim, have a great holiday!!! Can't wait to see yours!!! Sounds gorgeous. The solid with the printed shirt is a great idea. I nearly bought the red Prada satin backed crepe to make a Charlotte skirt for work. Maybe I'll buy it and make a Dokota instead. Hmmnnn... shame I've already sent one order to Minerva today! I vote Dakota of course ;o) Hehe! Ooh, I can't wait to see this! And I love that blouse. I have a heavy knit that does not have a lot (at least, to me) of stretch to it. I'm debating whether or not I should use it or stick to a woven to be safe. 60% polyester, 35% rayon, 5% spandex - use it or save it for a different project? Hi there! If you're comfortable sewing with knits then I say go for it...Rachel made a stunning Dakota out of a sturdier ponte knit: http://houseofpinheiro.blogspot.co.uk/2013/11/winter-dakota.html. We've got a guest blog from Lladybird lined up on using ponte for the Dakota and Rachel will be sharing her tips on customising the pattern for knits as well. However, if you're in any doubt, join in with a woven Dakota to start and you can then make a second in jersey...or perhaps save it for something else?! What a fierce combination Marie! You're going to look stellar. This does sound like it will be gorgeous!